Maybe Ophelia should have followed Hamlet’s advice. Julie Andrews — or was that Carrie Underwood? — checked into a nunnery in The Sound of Music and, in spite of some serious compatibility issues, wound up with a husband and a singing group. The same thing happened to Whoopi Goldberg in Sister Act when she hid from a Las Vegas gangster at a San Francisco convent and wound up leading a choir of nuns in a command performance for the Pope. The musical version, transplanted to Philly and currently completing a very successful summer season at CPCC, makes it a little clearer that lounge singer Deloris Van Cartier gets her man. Some might say that Sweaty Eddie, the shy and timid police desk sergeant who whisks Deloris into hiding, mans up at just the right moment and gets his woman. No matter, there’s plenty of righteous jubilation at the end. Relationships with Deloris tend to be turbulent. She disdains the timid Eddie even though she knows he has a crush on her. Yet she submits to the indignity of being gangster Curtis Jackson’s piece-on-the-side, because he might soften up and get her a record deal. That relationship sours when Curtis gives Deloris one of his wife’s hand-me-down coats for Christmas — a rather noxious blue number — but before we can see whether she’ll follow through on her resolve to walk out on him, she witnesses Curtis killing off one of his henchmen. So that relationship is also on the rocks. It’s only when Eddie puts her in the witness protection program at Queen of Angels Cathedral that we arrive at the relationship that gives Sister Act its true spark. Eddie and Curtis merely represent the diverging paths Deloris might take in life. Mother Superior is her polar opposite, disciplined, dignified, god-fearing, ascetic, and tradition-bound. Comical shockwaves fly in both directions when they meet — as soon as Mother Superior espies Deloris’s glittery scanty attire, and as soon as Deloris whips out a cig. What elevates this script, adapted by Cheri and Bill Steinkellner from Joseph Howard’s screenplay, is the attention it gives to the Mother Superior’s spiritual crisis as Deloris’s leadership of the choir brings crass commercial success to the struggling Cathedral. The stinging line she nails Deloris with, “God sent you here for a purpose — take the hint,” gets flung right back in Mother Superior’s face. CP and director Corey Mitchell are so fortunate to have Paula Baldwin for their top nun. While Baldwin gets great comedy mileage out of Mother Superior’s discomfiture, she also delves deeply enough into the Mother’s spiritual anguish for us to empathize, even if we can’t climb aboard. It would be an overstatement to say that Baldwin can’t sing a note, but there are some notes Mitchell and music director Drina Keen should have advised her not to sing. Speaking some of “I Haven’t Got a Prayer” would have helped, but it remains one of the evening’s highlights. Conversely, singing rather than acting is Jessica Rebecca’s strong suit as Deloris. She’s a fair substitute for the infallible Whoopi in the comical moments, but she’s an absolute force of nature when she breaks into song. I’m not sure that Rebecca even needs a mic when she’s belting at Halton Theater, but she was certainly overmiked for most of opening night. I only began to feel raw emotion from Rebecca at Eddie’s apartment when she sang “Fabulous, Baby!” her second pass at proclaiming her aspirations. So it was especially devastating when she suddenly grew soft segueing into the title song, where she realizes the love, sisterhood, responsibility, and growth she has experienced at Queen of Angels. A goose-bump moment, for sure. Rebecca towers over Christian Deon Williams, making it all the easier for him to simulate Eddie’s timidity, but the richness in his lower range as he sings his aspirational “I Could Be That Guy” tips us off to his manliness too soon. Big as he is, Stephen Stamps could stand to be raunchier — and older — as Curtis to get the full comical menace out of “When I Find My Baby,” a doo-wop love song with murderous intent, but his Barry White shtick later on is workin’, Babe. Curtis’s backup thugs have a nice ethnic diversity, Justin Miller as Joey, Alex Aguilar as Pablo, and Justin Rivers as TJ, all of them getting prime spots in “Lady in a Long Black Dress.” More individuality is lavished upon Monsignor O’Hara and three of the nuns. It’s Beau Stroupe as O’Hara who prevails upon Mother Superior to offer refuge to Deloris and is then surprised — and surprisingly enthused — about the rock and gospel Deloris infuses into Sunday services. 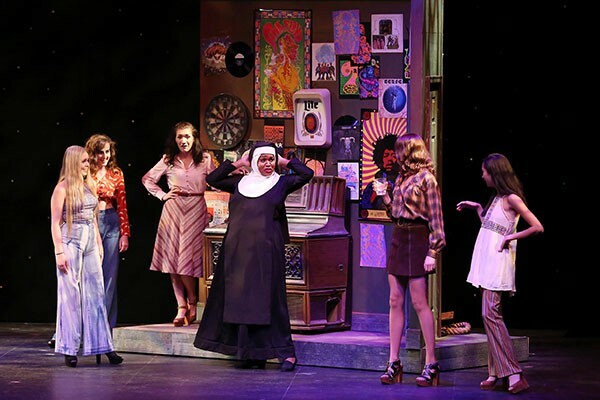 Megan Postle is preternaturally welcoming and upbeat as Sister Mary Patrick, exactly the quality needed to maximize the comedy of “It’s Good to Be a Nun.” Caroline Chisholm is the conflicted postulant, Mary Robert, instantly drawn to Deloris’s worldliness. She has some prodigious high notes lurking within her, but Chisholm maintains her innocence even after Deloris helps set them free. As the usurped choir director, Sister Mary Lazarus, Kathryn Stamas is the most surprising of the nuns. Not only can she kick aside a piano stool with a flair that would make Jerry Lee Lewis proud, she can kick her left foot as high as her ear, kicking sideways. Unless you truly expected the Halton’s stage to be transformed into a cathedral worthy of a Pope’s visit, you’ll be impressed by Jennifer O’Kelly’s set designs — and by how slickly one scene melts into another. Except for the glittery getups worn by Deloris and her backup duo, costume designer Theresa Bush reins it in, but the papal finale is pretty fab. Alan Menken’s “Here Within These Walls” echoes his own “Beauty and the Beast,” a letdown where there should be uplift. But his “Sunday Morning Fever” — and a couple of his other songs here — will waken disco memories of Travolta, the Bee Gees, and their Saturday Night Fever, a trashy touch that somehow adds to the fun. 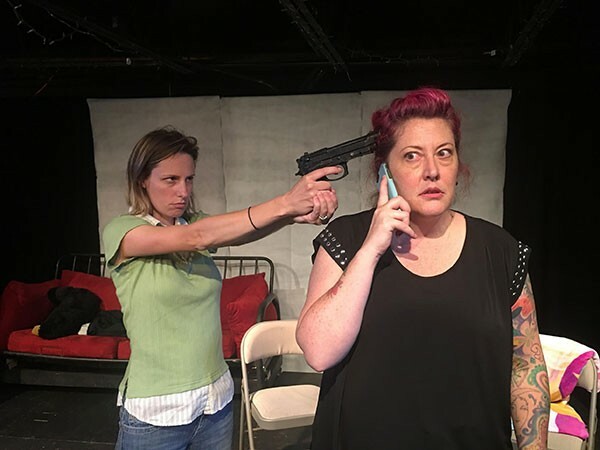 A similar vein of humor runs through Killing Women, a black comedy presented by Stephen Seay Productions at UpStage. Gwen is involuntarily recruited into a ring of hired killers, a profession totally inimical to motherhood. Forget about spiritual uplift as two other pistol packers, vulgar Abby and elegant Lucy, pitch in with the childcare. Gwen earns one of the most hilarious character descriptions I’ve ever heard, rightly labeled a “do-it-yourself widow” by Abby. The action really revolves around Abby, for after Lucy splatters her hitman husband’s brains on their living room wall, Abby’s callous boss, Ramone, decrees that she must knock the mother off. What passes for Abby’s heart shines through here, for she sells Ramone on the notion of grooming Lucy to replace her dead husband at the firm — but only gets one week to deliver. Turns out that Gwen has considerable aptitude: she’s a crack shot and more than one hitman is smitten by her, though her body disposal skills need work. Luci Wilson carries the show as Gwen, no less rough-around-the-edges now than when I first saw her in 2008 with the Robot Johnson sketch comedy group. That’s a good thing, and when we finally see all her tattoos, we’re not even slightly surprised. A less confident, more wired performer, Elizabeth Simpson seems to know Gwen from the inside, and Seay casts two blue-chippers, Lesley Ann Giles and Christopher Jones, to fill out his front-liners as Lucy and Ramone. Cameos are quirky as everything else in Marisa Wegrzyn’s script, Matthew Schantz and Field Cantey handling them quite well.